The food and beverage industry is a constant presence in our daily lives by transforming raw ingredients into finished products ready for consumption. This industrial chain includes the processes of production, processing, storage and distribution. The storage conditions of these products has a direct impact on our health, requiring control and regulatory supervision by agencies, standards for the validation of the appropriate processes, as well as regulatory approval for manual production and operating routines. Transforming natural resources into quality products presents many challenges for companies. The challenges begin with research and development work, the selection of raw materials, and span all processes, always guided by quality and safety. This sector is also known as Food Service (food outside the home), it includes the areas of baking, confectionery and meals (crackers, pasta, breads, cakes, ice cream, candy and confectionery, fried foods, snacks and others). This ever increasingly diverse product range requires more sophisticated control systems, capable of ensuring final product quality through the efficient control and monitoring of manufacturing, storage and production performance in real time. The control system includes: ? Control of the process and production; ? Recording and real time supervision of the entire production chain; ? Integration with SCADA supervision systems, dataloggers and database; ? Remote monitoring over the Internet using NOVUS Cloud service. The Brazilian beef cattle industry occupies a prominent position in the local economy and international trade. The world meat market has undergone significant changes over the past decade and Brazil has become the largest exporter of beef in the world. The resulting structural changes in the meatpacking industry required a production process increasingly efficient and automated. NOVUS knows this market and its needs, so it has developed equipment and solutions for the monitoring and control of these systems. These include: ? Recording and onsite monitoring using wireless equipment; ? Controlling process variables: temperature, humidity, pressure, level and flow; ? Integration with SCADA monitoring systems, dataloggers and a database; ? Remote Internet based monitoring using the NOVUS Cloud service; ? Shop floor integration with ERP systems; ? Alarm notifications sent via e-mail and SMS. 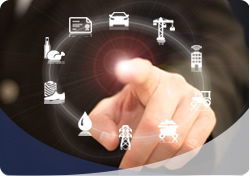 In the industrial and infrastructure sectors it is frequently required to measure, record and control the energy consumption of equipment and processes. With this in mind, NOVUS has developed systems to measure single and three phase power usage. With data in hand, our process controllers can take corrective and preventive actions, and store historical data for future analysis. All this collected data can be made available for access anywhere through the NOVUS cloud system, composed of GPRS gateways, 3G, Ethernet and dedicated Web servers. • Monitoring over the Internet using the NOVUS Cloud service.